Drinking chamomile tea before bedtime is often suggested to help you enter the land of nod. Its healing properties have been recognized for centuries, dating back to the ancient Greeks and Romans. But tea isn’t the only thing made from the chamomile flower. Aceite de manzanilla, or “oil of chamomile,” is a popular remedy long favored in Central and South America, as well as in the Caribbean Islands. We know it as chamomile oil, and its value as a therapeutic oil has transcended geography, time and history. The history of herbal medicine pre-dates modern-day medicine by hundreds of years. Chamomile oil shows up as a topical remedy in writings from the ancient Persians, and, in fact, it’s still used today by practitioners of Persian medicine. A traditional Persian headache remedy that has survived through the ages is made from a mixture of chamomile oil with sesame oil, which is dabbed onto the temples. The Spanish word for apple is manzana, and since the smell of the chamomile flower most closely resembles the fragrance of apples, it’s referred to in Spanish cultures as a “little apple,” or manzanilla. Te de manzanilla is one of the most-often requested herbal beverages in Latin America. Actually, te de manzanilla is not a tea at all; instead, it’s a tisane, which is made from a plant different from the tea plant. Tisane contains no caffeine, and chamomile tea is a flower tisane known for its detoxing properties. Chamomile has also been called the “doctor of herbs,” and many gardeners plant the flower in their herb beds to bring health to other plants that are not doing well. 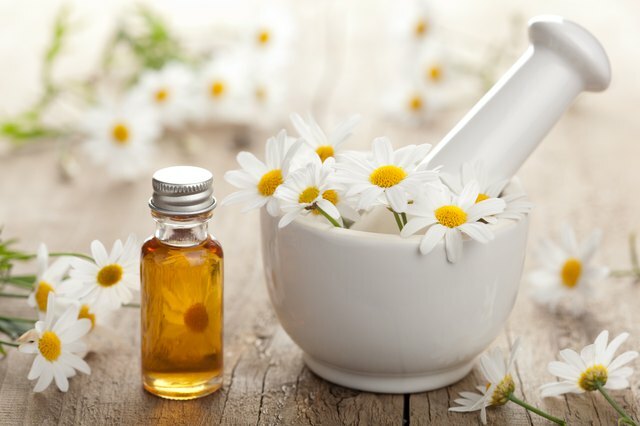 In addition to tea, oil of chamomile is the next popular usage for the flower, and its remedies are directly connected to the origin of the flower itself. Aceite de manzanilla is an essential oil, which means it’s derived from a plant. Its essence produces an aroma that has an effect on the brain and body. Often used in aromatherapy, a true essential oil has been distilled or cold pressed and then combined with a carrier oil. No chemicals are added or used, and nothing synthetic has been combined with the essence. As with all science, differing opinions exist as to the efficacy of therapies outside of the recognized medical establishment, and the FDA neither condones nor condemns the use of herbal treatments. Studies of the effectiveness of chamomile flowers are inconclusive, but results suggest that people who are allergic to ragweed probably should avoid chamomile. The chamomile flower has an appearance similar to that of a daisy, but its herbal influences extend far beyond the simple daisy's. Roman chamomile grows close to the ground, has hairy stems, huge flowers and smells slightly of apples. German chamomile has few flowers and emits a fragrance of straw. 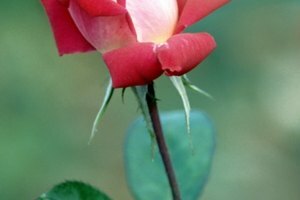 Yes, they are two different flowers with similar healing properties, but they belong to two different species of plant. Herbal practitioners note the difference in taste between the two and recommend a specific chamomile for certain ailments. The most distinguishing feature of German chamomile oil is its color. The deep blue hue is due to the presence of a chemical compound called chamazulene, which is known for its anti-inflammatory properties. 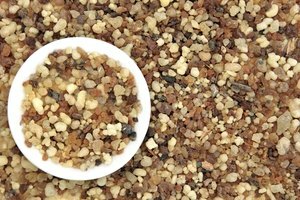 Its most common use is for skin conditions: Eczema, psoriasis and any type of dermatitis have been treated with German manzanilla oil with success. Producers of beauty aids have discovered the healing properties of German chamomile oil, and they are now packaging it in face masks, skin treatments and topical creams. Other benefits of German chamomile oil, as touted by herbalists and realized by users for centuries, include using it as an aid for digestive complications, to relieve the symptoms that come with menstrual pain, and the depression occasionally brought on by childbirth, menopause and PMS. The immediate visual characteristic of Roman manzanilla oil is its yellow coloring, occasionally lapsing into a pale blue. Rubbing the oil into muscles sore from exercise or arthritis brings relief for many sufferers. If you sometimes have migraines or persistent headaches, sipping tea made from Roman chamomile has been reported to be successful in tempering the pain. Botanically, German chamomile is known as matricaria recutita, and Roman chamomile’s Latin name is chamaemelum nobile. Recognizing the two different names is helpful when shopping for aceite de manzanilla. Both should come in a dark, glass bottle, which protects the contents from the deteriorating effects of light. Check the labels to distinguish which one you are buying and to ensure no other additives are present other than the chamomile and the oil. Not only ancient people, but also modern-day parents turn to chamomile in oil and tea bag form to help calm fussy babies. It’s a digestive relaxant, helps calm infants for sleep, aids with the pain of teething and has been known to help with diaper rash. Before giving your infant any herbal treatment, check with your pediatrician for any conflict and recognized allergies. Once you are cleared, only use chamomile tea in bag form for the bottle. This eliminates any possibility of the loose tea becoming infected with bacteria. Steep the tea for about 10 minutes in a covered container, and then let it cool. A 2‒3-ounce bottle, once a day, is recommended. It’s suggested that babies under the age of 6 months do NOT drink chamomile. And check the ingredients of the tea bag: You want chamomile only. Period. 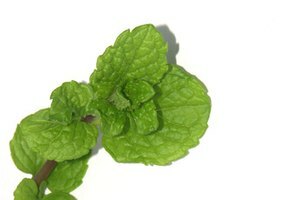 If you’re using it topically, just a dab on the skin in the beginning is a test for the infant’s tolerance to the herb. In addition to the calming effect of chamomile tea, chamomile oil has been used as an anxiety reducer for cancer patients. Dr. Andrew Weil reports that a study of cancer patients demonstrated that a massage with Roman chamomile oil reduced the patients’ anxiety. It also helped relieve skin conditions and headaches in study participants. Dr. Weil suggests that mouthwash containing chamomile oil helps control gingivitis, and, if used topically, chamomile oil can reduce knee pain caused by arthritis. It also improves the hand and wrist functions of those suffering from carpal tunnel syndrome. A note of caution to pregnant and nursing women: Chamomile oil may cause contractions or stimulate allergies. As we as a society start questioning prescription medicines as we’ve always known them, a look into the history of herbs and their essences is worth noting. Hundreds of years of traditional herbal cures have endured without those side effects described at the end of commercials touting the newest medication to hit the market. Perhaps a combination of the two methods of healing should be investigated. The Greeks, Romans and Persians were on to something. 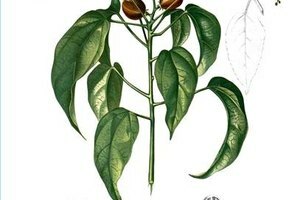 The Spruce Eats: That Is a Tisane? Healthline: What Are Essential Oils, and Do They Work?